I'm pleased to report success on our second attempt at Monte Grappa (1774 m, starting altitude 184 m so proportionately a greater ascent than Everest!). The first ascent via a shorter (hence significantly steeper) route caused distress through altitude and gradient induced hyper-ventilation and had to be abandoned within 300m of the summit. 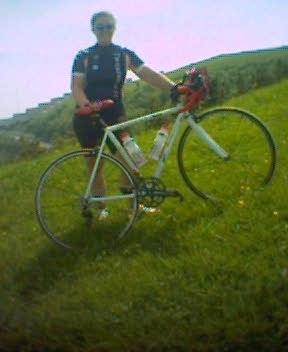 This one is of Lis as far up Monte Grappa as you can go in shorts! The steps in the background are an elaborate Mussolini inspired war memorial of the 'Grande Guerra' and you have to be respectfully dressed to pay your respects (fair dos) and inspect the very top. You can't cycle there regardless of trouser length. In addition to Peg, Lis has new red patent leather Sidi Ergos (hidden by the veg) but no less a hindrance to non-pedal powered locomotion! Obviously, I was there to take the picture and glean historical background, I even went by bike! I notice from the Beeb that it was raining in the UK today? Heartfelt commiserations!